Formed in 1971 London, Foghat are a hard working band that earned their success on the road throughout the United States in the seventies. Much like Humble Pie, their no nonsense Rock 'n' Roll approach appealed to the blue collar music fans of the time. By the mid-eighties, the band's record sales began to decline, with them finally calling time around 1984. 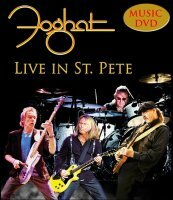 The original line-up reformed in 1993, at the urging of producer Rick Rubin and, once again on the live circuit, Foghat did good business. Changing line-ups and the death of founding members Dave Peverett and Rod Price in 2000 looked set to derail the band. However, original drummer Roger Earl recruited singer and guitarist Charlie Huhn, a talented musician that had shared the stage with Ted Nugent and Gary Moore during his career, to continue the band. With the current line-up also featuring Bryan Bassett on lead guitar and bass player Craig MacGregor, this DVD captures the band in full flight on stage in Florida. Huhn has, for me, always been a much underrated front-man and guitar player, his work with Nugent on the 'Weekend Warriors' album is a high recommendation from me. He is the focal point of the band on stage and his voice a perfect match for such classics as 'Fool For The City', 'Road Fever' and 'Drivin' Wheel'. He also plays a mean rhythm guitar. The camera captures the band well, though the audience are all but absent – only during 'Slow Ride' do we get to see their reaction. There is a short but sweet drum solo and a few band introductions, though it really is just about the music. The picture quality is not always the best, and with no extras or audio options, it is a very vanilla release. That said, as a statement of where the band is musically in the live environment today, it certainly cannot be faulted.